Born in 1967 a year before the summer of hate, makes his first recordings as a 13 year old under the name Taeb Zerfall and putting it out on his own Zerfall Tapes label.. then 1986 foundet the Monsters, and in 1984 changing the name from Taeb Zerfall to Lightning Beat-Man the Wrestling one man show.. and then 1999 changed his name to REVEREND BEAT-MAN,1992 founding the voodoo rhythm label. Reverend Beat-Man is not only a One Man band it is A MISSION an Mission for the Blues Trash church.. with only a Guitar a Kick Drum 1 Hi Hat and a microphone Reverend Beat-Man tells you story’s about Dead, the Live about killing and about the lost love and about seeing the Light ..this is kinda a new way to preach the Gospel to the people, it’s all very raw and primitive with a lot of Blues Trash and Primitive Rock’n’Roll and Gospel music in it.. and HE PREACHES !!! believe me brothers and sisters he will bring you on the wrong track of live and then gets you back to the blues trash church !!! 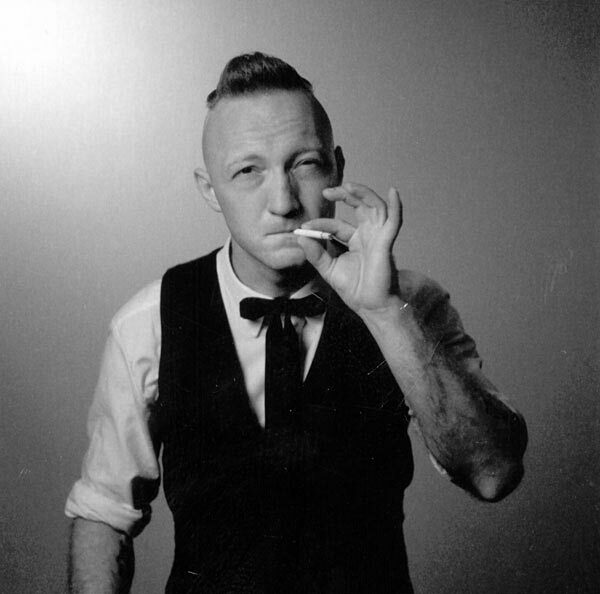 Reverend Beat-Man sells his records all over the globe and has over 30 out puts with him alone and with the several bands he plays in (the Monsters, die Zorros, the Coronets, Lightning Beat-Man ) produced several Videos all extremely strange and weird, plays also with backing bands or doing performances in churches Theatres and Galleries.